This week Imogen was lucky enough to attend the Mobile UX London event and like a good hunter-gatherer she has brought back the educational spoils for us to share around camp. 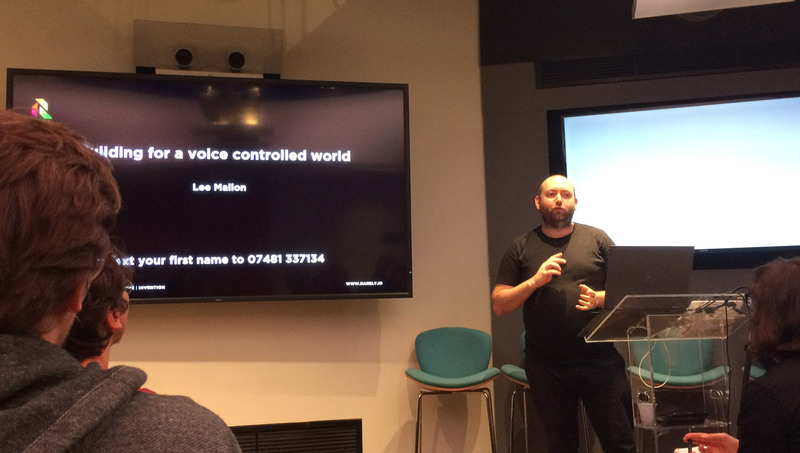 One area that has sparked the team’s interest is a talk on designing for voice. So, without further ado, here are the top three things that we learned listening to the voice of Lee Mallon of Bournemouth-based Rarely Impossible. 1. What do you mean, I’m adopted? Voice technology isn’t following the usual pattern of generational adoption, both the very young and the elderly have started using it at almost exactly the same time. Imogen believes that this is because there is less of a learning curve required to start using the more natural interface?. Use of Voice in a rapidly aging population has some seriously interesting applications. The ability to make changes around the house, like adjusting your thermostat or turning on the light could be valuable for people with impaired mobility. Reminders, timers and list making features are equally helpful to a parent managing a pack of unruly children as to a member of the older generation whose memory has begun to falter. Newer Alexa features like Alexa Calling and Messaging (Alexa to Alexa calling) and hardware like the Echo Connect (which connects your landline to your Echo device) have the potential be life-saving in emergencies as well. Setup is key in making Voice technology work, however. At the moment the middle generation serve as tech support for their parents and older relatives. Setup processes need to bear in mind the fact that these family members will sometimes need to remotely manage devices on behalf of others. 2. Putting that voice to work. Voice technology has great potential to speed up monotonous work tasks, but people in different parts of a business are going to have completely different needs. This points to an increased demand on developers to do their user research! Think about it: HR staff will be able to ask their voice assistant how many people are off sick on any given day. 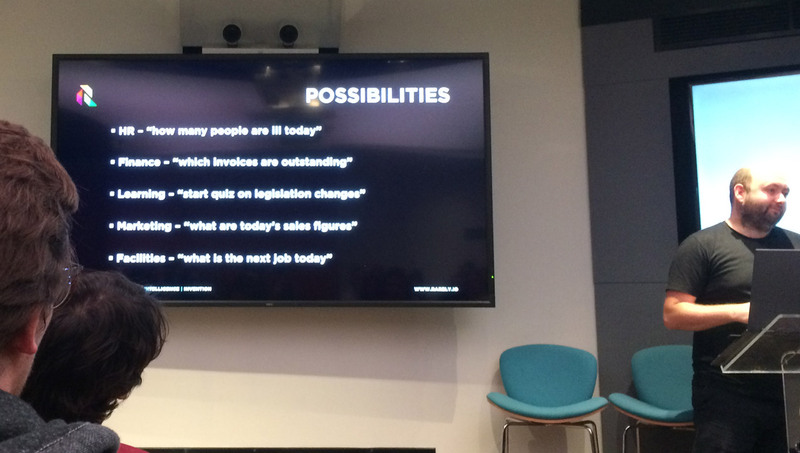 Marketing teams will be able to call up sales figures with a simple question. Setting up meetings, checking statistics, managing data; all can be achieved with a simple voice command. All of these things are possible with the voice recognition and AI technology that we have today, so it is difficult to imagine that the effects in the future aren’t going to be even more pronounced. Lee highlights the potential of Voice for training programs. With Voice you could create immersive training environments with sound and timed instructions producing greater realism, better engagement and more flexibility for training teams that no longer have to worry about absences when they can just drop people into a simulation. 3. Security that you can talk your way around. Security is still a serious challenge, particularly from the perspective of a business with sensitive data. Amazon and Google are both working on developing voice identification but they are not yet ready for market. In the past, the problem has always been that any identification loose enough to account for all the variances that normally occur in a human voice can be tricked by an impression, and any that require too specific a response lock the users out the first time they have a cold. Finding the balance for voice ID is tricky. A simpler solution, that makes you feel a bit like a spy, is to set up a smart PIN. For instance, you could tell Alexa that your password is the real answer plus 3, and when it asks “What is 4 + 2?” you reply 9 to unlock the device. The more contextual information a digital assistant has, the better it will be able to serve you. How people use Voice Assistants will also depend entirely on where they are and what they are doing at the time so contextual research is going to be vital. Many of the benefits of Voice are still unrecognised, but as the technology is refined to cut out background noise and to be more responsive to contextual information it isn’t hard to believe that voice might take over from keyboards as our primary means of communicating with our devices. Could we be looking at a hands-free future? Imogen has always been intrigued by human behavior. She cut her teeth as an anthropologist, researching with Tibetan refugees in the Indian Himalayas for her doctorate. As an experience researcher at Sutherland she works across different industries, using her ethnographic skillset to tap into customers’ perspectives. When taking a break from people-watching, she can be found singing choral music in Greenwich or planning her next foreign adventure.